Hours: Varies with shows. Check website. 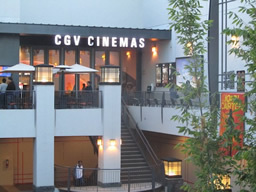 The first U.S branch of a South Korean chain, the CGV cinema plays American blockbusters (they love Sci-fi) and Korean films on four screens. English language films are sub-titled in Korean and the Korean films are subtitled in English, so language is never an issue here. South Korea is enjoying a cinematic renaissance; outside of the festival circuit, this is the only place in town to catch many of the latest South Korean pictures. The CGV lobby has a lounge with cube chairs and HD TV screens spooling previews and K-Pop videos. The café serves pastries, lattes, a wide assortment of teas, even yuzu smoothies, made from East Asian citrus fruit. Korean movie stars and directors often drop by to promote their films and mingle among their fans. Seating is reserved. They have a free membership program which knocks $1 off the ticket price and offers frequent moviegoers discounts on movies and snacks. The CGV is right across the street from the Wilshire/Western Purple Line station: Koreatown movie theaters don't come more convenient than that.